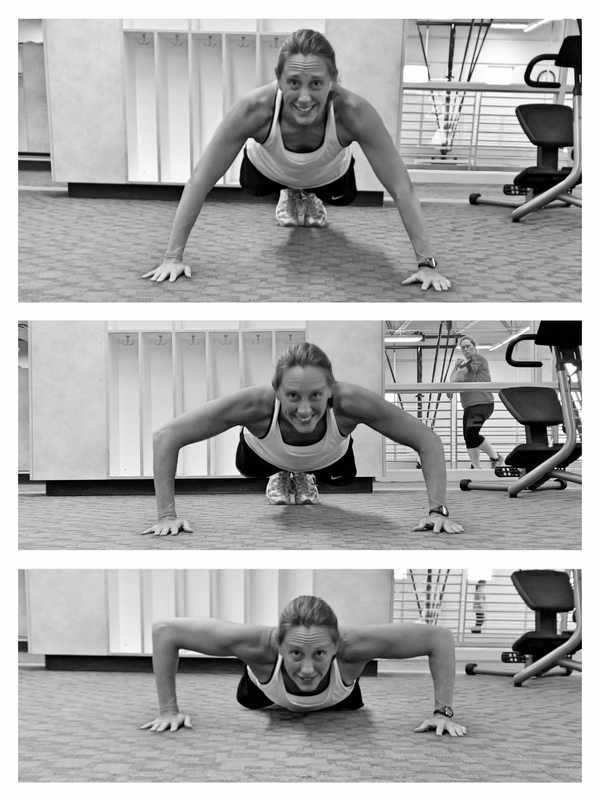 I was doing pushups in front of a mirror at the gym to make sure I kept my head up and noticed that my shoulders were working pretty hard… so I had my husband snap some photos. HA! Linked here is the page where I will log my progress every week with my newest fitness challenge to myself. I just finally added my “before pictures,” which are a good reality check. HA! I hear this all the time. ALL THE TIME. I usually just chuckle and mutter some response having to do with really enjoying it because explaining it to someone who does not have any interest in running is just too difficult. I have a lot of reasons for why I like to run, but one of those reasons is one simple word. I love being outside and taking it all in. I love seeing wildflowers and cranes and deer (and the once-in-a-lifetime wild black bear). I love wondering to myself why wildflowers are always purple, white, blue, or yellow and never a nice pink. I love spotting a beautiful deer with fuzzy antlers behind a tree beside me even though I see them almost daily in the field by my house. I love keeping an eye on our resident bald eagle pair in the winter. I love the sound of the creek washing downstream just a few feet from the trail. Fall Fitness Plan is Created! I have gained a few pounds. I know that 5 pounds isn’t a terribly huge deal, but it is to me because they’ve hung around for quite a few weeks now – they would like to be here to stay. This means I’ve been above my threshold weight most of the summer, which is sort of depressing. This is expected when I train for distance runs because I’m hungry all of the time, but the truth is I’ve been eating like I don’t have to worry about what I’m eating, and I’m just not built that way. So, in the interest of getting things back on track, I’m starting tomorrow. The plan is in place and I will measure in and post starting stats before the day ends tomorrow. It’s a longer plan than I’m usually up for (I like an 8-10 week plan), but it goes through 11/2 (12 weeks) to finish up my current race schedule. After that, I’ll kick off something else for the new year! Here is the plan for now, but I may tweak it tonight. 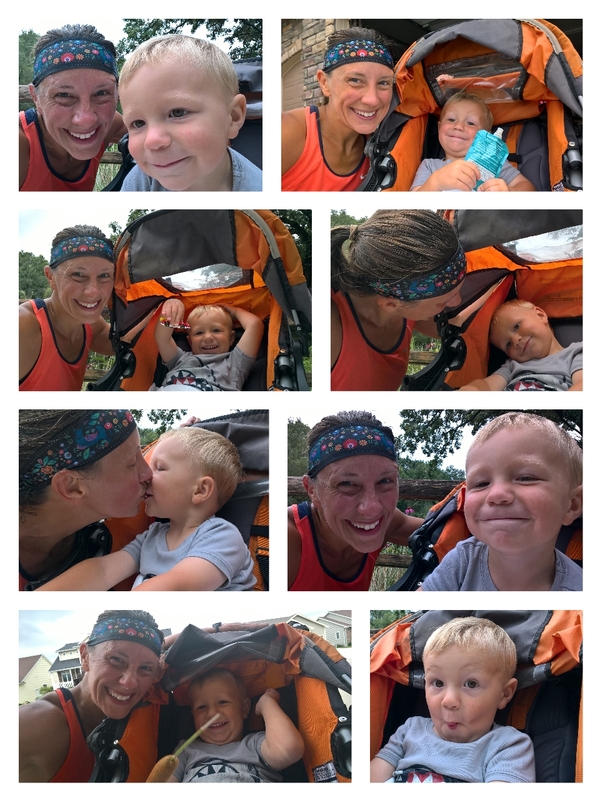 Oh Hey – I Started a FB Running Group! Because I can’t NOT have a project at all times, and because a bunch of us finished up our half marathon training but still want to keep running, and because I like group motivation… I created a running group on FaceBook. It’s secret, so you won’t find it if you look for it. But if you want to be added, please send me an email with your FB name and I can add you! I’ve always dabbled in trail running. I’ve always liked the idea of it but always dreaded hills, and trail running is nothing but hills most of the time. In fact, hills used to make me cry (I’m embarrassed to admit it, but I’m an honest gal). Instead of running the singletrack trails, because of those pesky hills, I got a mountain bike and enjoyed the trails that way. I was never really good at trail biking, but I got out whenever my husband and our friend wanted to go. There were a few accidents, nothing major (although one should have been), and I really liked being in the woods. We did run a winter trail race many years ago and have done what is touted as the largest cross-country race in the nation (I am not sure if that is actually an accurate statement, but whatever!) a couple/few times in addition to a 15K trail race many springs ago. That spring 15K in 2009 really did me in and I think I decided then not to pursue trail running as a hobby. It just wasn’t my thing. I mean, there were lots of hills. 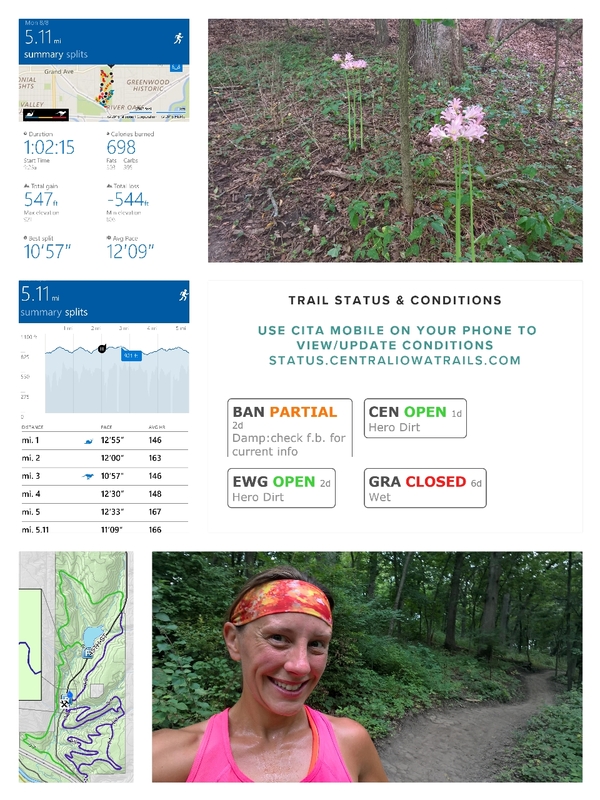 But then my friend and I decided to run that winter trail race again in 2014 (because it was flat) and I thought maybe, just maybe, I could enjoy trail running for real. 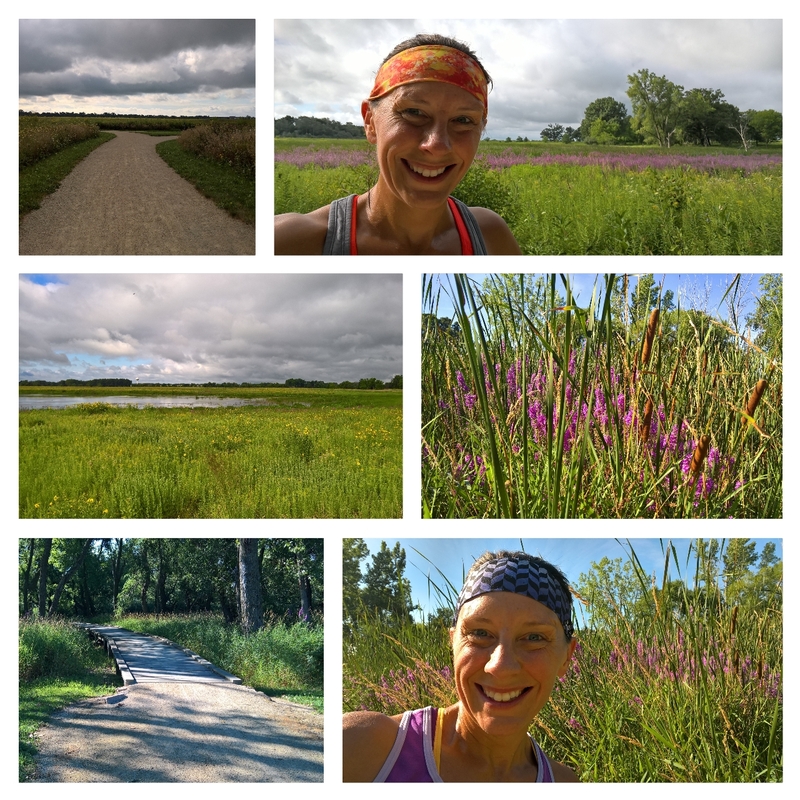 Today, I headed back to our center trails and went for a run by myself. My husband felt confident that it would be safe, which made me feel confident. When I got there, there were a few cars in the lot with empty bike racks – a good sign – and I saw a pair of runners immediately. I started my fitness band and was off. My planned course didn’t work out because I ended up doing the same loop twice right out the gates, but that was alright and I headed north for the cross-over to the other trail I was doing. I passed an elderly guy (who was in ridiculously great shape) on my way north and then ran into him again as I was in mile #3. We chatted and he asked where I was headed and if I minded if he ran with me. Honestly, I felt safe but a running partner is never a bad idea so I said of course I didn’t mind. He wanted to be pushed and assessed that I was faster than him so he trailed me by a few strides, shouting out directions for me as we came to forks in the road. It was awesome! He was great and he was very concerned with my safety (“watch that stump, jump high over that downed tree, watch out for that flag”). He runs there almost every day so I’ll see him again, I’m sure. He was not thrilled with my parking choice so ran with me back to my car and advised of where to park next time. I totally dug that dude! I did 5.11 miles! I was shooting for 4.5-5.0 so I was pretty happy with the final mileage. Running the trails is crazy-intense because you cannot take your mind off of what you’re doing. You have to constantly be looking where you put your feet and feeling where you put them. There isn’t even a moment to check your mileage on your band, which is a good thing. You burn WAY more calories even though your pace will suffer (12:09 versus a pretty consistent 9:00-9:30 on the road) because of the hills and exertion. I just love it! I love it so much that I’m trying to sort out my plan for tomorrow! Barre class or hit the trails? We shall see! Fall/Winter Race Schedule is On! I need to find something in November… I have some ideas! 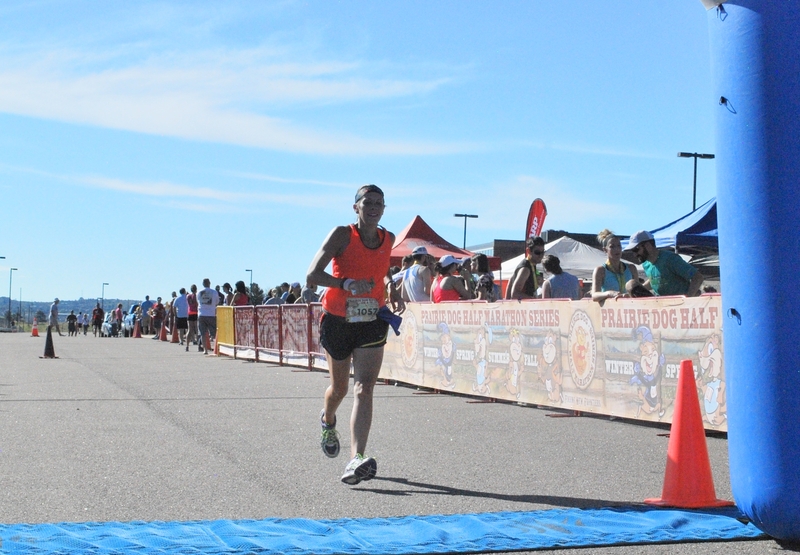 Crossing the finish line of half marathon #3! It may be grainy, but It’s me!